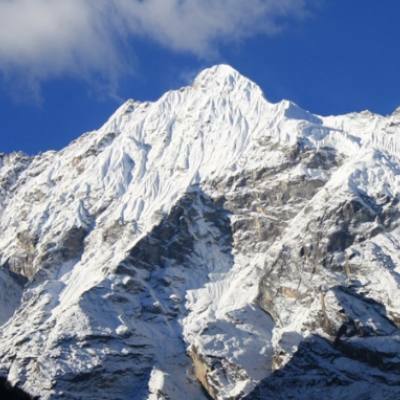 Explorer Adventure offer Manaslu Circuit Trekking, where adventure leads you around Nepal North Mid West Himalaya region in the country of worlds eight highest Mt. Manaslu with range of smaller peaks includes Sisne Himal, Bouddha Himal and Himal Chuli with series of mountains as far towards Lamjung and Ganesh Himal. Mt. Manaslu towers high at 8,163 m and 26,781 ft, the mountain first climbed by Japanese mountaineers in May 29th 1956, since then it was closed for outside visitors and then opened in mid 1980s, till then it was least explored and remained a remote and isolated Himalayan destinations. 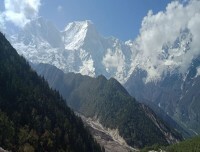 At present getting popular due to its picturesque scenery of high peaks, unique landscapes covered within enchanting woodland of tall rhododendron-pines and fir tree lines as vegetation disappears for wild windswept terrain of arid and arctic cold zone with remorseless fields of ice and glaciers as walk proceeds higher Manaslu valley. 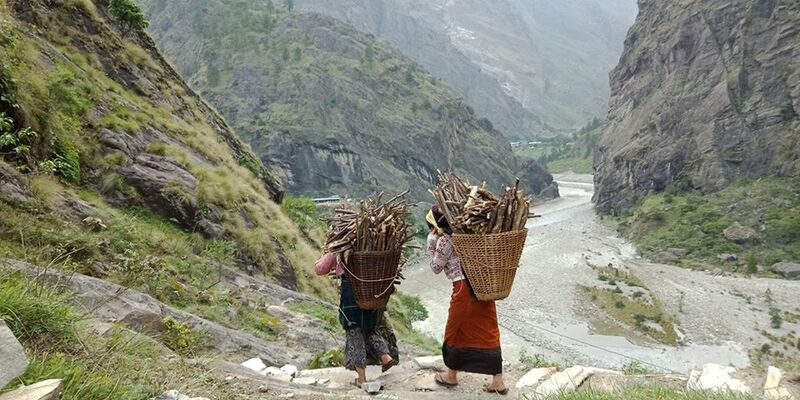 Manaslu Circuit Trekking leads to nice and charming villages of Philm-Jagat-Lo Gaon, Sama Gaon and Samdu which is a mere distance towards Nepal and Tibet borders, country of outmost beauty enriched with ancient Buddhism traditions and religions where you can witness its age-old heritage and colorful cultures on this marvelous Manaslu Circuit Trekking. Taking a long exciting overland drive to reach low warmer areas around Gorkha district home of historical Shah Monarchs and then walk follows upstream to reach cooler alpine zone within woodland and soon fades to arid and barren wilderness to cross over high and scenic Larke-La pass to land around Manang areas on popular Annapurna Circuit trail. From here on good scenic trail to reach a road head for interesting drive back to Kathmandu with grand memories of overwhelming adventure on Manaslu Circuit Trekking. 1 Day 1: Arrival in Kathmandu and transfer to hotels.On reaching Kathmandu Tribhuwan International Airport where you will be warmly received by our guide and staff and then transfer you to your respective hotels in the hub of Kathmandu city. First check into your hotel rooms on getting refreshed from the flight and with Jet-Lag, then join with other members of Manaslu Circuit trekking for group briefing, where our expert guides will inform regarding your stay in Nepal, hotels, trekking, local lodge and overland drives with do’s and don’ts information, evening welcome group dinner in authentic Nepalese restaurants with Folk cultural programs to entertain you during your meals. 3 Day 3: Drive to Soti-Khola 1,470 m via Arughat town 645 m - 06 hrs.Morning an exciting drive on Kathmandu to Dhading and Gorkha districts on main busy highway for few hours and then heading towards Himalayan foothills, on reaching at Trisuli River within warm sub-tropical area, as our journey continues towards uphill on long winding road towards cooler alpine area past farm villages and town to reach at Arughat town. From Arughat town following Buri-Gandaki River upstream on dirt trail to reach our overnight destination at Soti-Khola, a small farm village slowly turning into a large village a town due to construction of motor-able road. 4 Day 4: Trek to Machha-Khola 930m - 06 hrs.Starting our first day walk of the adventure, where walk leads following the raging Buri-Gandaki River upstream, into a gorge covered within dense forest as our route leads to a climb within cool shade of forested areas, after a good walk of six hours then reaching our overnight halt at Machha-Khola. Machha-Khola, a fair size village the name Maccha-Khola means a fish stream, a popular stream for fishing silver craps and other species of smaller fishes. 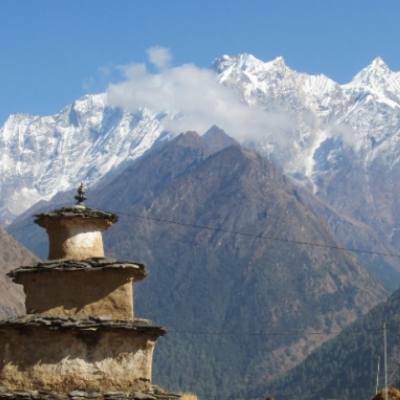 6 Day 6: Trek to Dyang 1,800 m - 06 hrs.From Jagat, walk continues heading higher areas through many small farm villages and then a short climb with downhill crossing over suspension bridge to reach at Nagjet and Philim, a large village with scattered farm houses. After Philim walk through farm terraces of golden fields of wheat’s and barley, then a climb on rocky ridge top into bamboo forest area to our overnight stop at Dyang village. 7 Day 7: Trek to Ghap 2,160 m - 04 hrsMorning walk from Dyang leads to cooler area where you can feel rise in altitude, on entering Himalayan alpine region, continue walk downhill to a river side to reach at Bihi Bazaar a small village near a river side. From here onwards encountering more villages of strong Tibetan culture, walk leads on gentle trail with few short ups and downs till Ghap village is reached for overnight stop. 8 Day 8: Trek to Lo Gaon 3,180 m - 06 hrs.From Ghap village with nice good walk following Burigandaki River, then crossing this river through small farm villages and cultivated farm fields of barley, wheat and millets to reach at Numrung village with first close views of Mt. 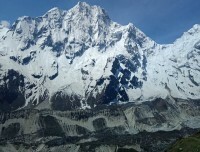 Manaslu North Face and adjoining peaks. Walk continues passing few villages of Banjham, Lhi and Sho, then as altitude gains with an hour up to Shrip village to Lo Gaon for overnight stop in a nice cozy lodge. 9 Day 9: Trek to Sama Gaon 3,530 m - 05 hrsAfter Lo Gaon tree lines fades only for few short juniper bushes and some willow trees, walk leads on nice path with views of peaks and finally the day ends at Sama Gaon for overnight stop, this is a large mountain village located on route Manaslu base camp, Larke-la pass and to Tibet border. 10 Day 10: Rest day in Sama Gaon for acclimatization.Rest Day in Sama Gaon, which is an ideal place for necessary acclimatization before the climb and to reach high Manaslu base camp, at Sama Gaon explore this interesting village similar to Tibetan culture and traditional way of life. 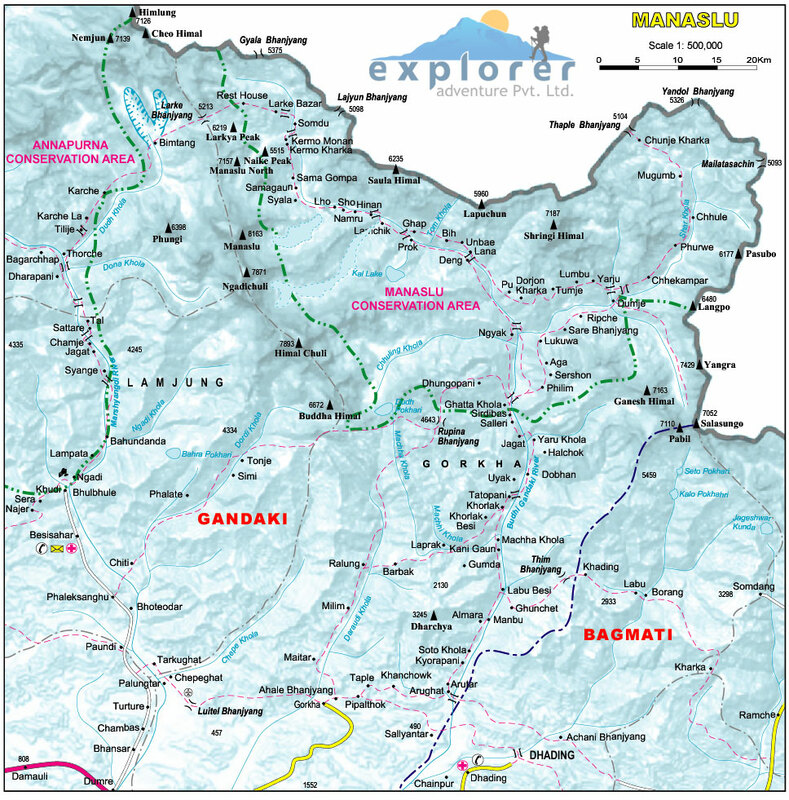 11 Day 11: Trek to Samdu 3,780m -05 hrs.After a pleasant day at Sama Gaon, trek climbs slowly towards Samdu and beyond, actually walk to Samdu is not too far can be done within few hours but due to high altitude within dry air makes the walk slower. Our route slowly leads at Samdu village which is the last village before Larke-la base and pass, at Samdu overnight in this interesting village of strong Tibetan influence due to its closeness to the border of Tibet, where trade still exists. 12 Day 12: Trek to Larke Phedi a base camp for Larke Peak and pass at 4,450 m.From Samdu walk leads to more barren areas, adventure begins crossing Gyala Khola, then ascending to the ridge where there is a ruins of a village known as Larke Bazaar. Presumably this village once thrived on trade with Tibet over the nearby Gya La, a trade which at present has diminished. Walk nears Larke Glacier reaching at Duwang, where there is a lodge serving travelers crossing Larke- La, overnight camp is just on a clearing. 13 Day 13: Traverse Larke pass at 5,135m and descend to Bhimtang - 08 hours.Walk from Larke Phedi to the top of Larke-la Pass at 5,135m starting with gradual winding uphill, to reach our highest point of the adventure. Morning climb leads past the valley on north side of Larke Glacier with magnificent views of Cho Danda and then of Larke Peak. Finally, walk across moraines of the glacier, making a gradual ascent which becomes steeper in the last section to the top of the pass. 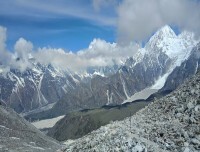 From the pass, outstanding views of Himlung, Cheo Himal, Kang Guru and Annapurna II can be seen. After a wonderful moment on the highest spot, a long descend follows over snow and scree, to reach the valley trail to Larcia. A further hour on a moraine ridge path leads to Tambuche at 3,900m and with short distance walk to overnight stop at Bhimtang, a lovely place on a broad and level valley with number of mani walls and lodge to stay. 14 Day 14: Trek to Gho 2,560 m - 05 hrs.After a long day walk to Bhimtang previous day, today an easy trek from here onward to Dharapani past thick forested area of pines, rhododendron trees with view of snow peaks. 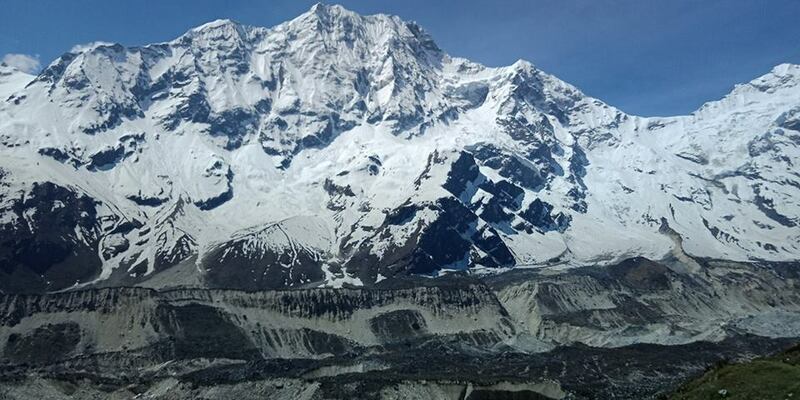 From Bhimtang descend to a valley of Burdin Khola which is the base of west side of Manaslu, from a ridge with excellent view of Manaslu towards south east with Annapurna II in the south west. Our route leads over Dudh Khola, where descend follows a trail into a narrow valley within forest to reach our overnight stop amidst forest surrounding in perfect tranquility after 5 hours of good walk. 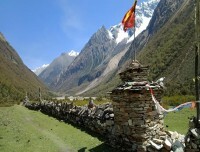 15 Day 15: Trek to Dharapani village 1,943m. 5-6 hours.From here the track leads downhill into forest passing small summer settlement and then climb on a terraced fields to Karche La, and then down to Marsyangdi River. After few hours walk reaching Tilje village on following Dudh (milky) river downstream, passing number of villages, including Thonje. From Tilje an hour climb after crossing a bridge and then joining at main trail of Annapurna circuit joins in Dharapani village. Dharapani a lovely large village will be a civilization after being in complete wilderness, where one can celebrate with a beer and buy hot shower from the lodge. 16 Day 16: Trek to Syange 1,460 m - 06 hrs.Our last day walk of this great adventure heads to southward, following on the main trail by Marysangdi River downstream, on crossing second bridge walk leads downhill all the way to Tal Besi. 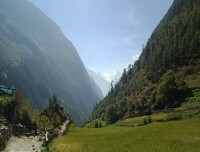 From Tal, an easy walk for a while then descend with great views of waterfalls, after few hours of good walk brings you at Chamje village after crossing a small bridge, heading downhill past another Jagat village to reach our ending point of the adventure Manaslu Circuit Trekking at Syange village by the raging Marysangdi River. 17 Day 17: Drive to Kathmandu via Besisar town and transfer to your hotels -06 hrs.Morning transfer for an exciting drive back to Kathmandu where drive leads to Besisar head quarter town of Lamjung areas and then on good road to reach lower warmer areas around Trisuli River and then driving on main busy highway to reach Kathmandu on good time, rest of the afternoon at leisure for individual activities. 18 Day 18: Depart for international flight home ward bound or to respective countries.Your last memorable day in Nepal after a wonderful experience and adventure on Manaslu Circuit trekking with great service of Explorer Adventure, and as per your international flight then transfer to Kathmandu international airport for homeward bound or to your respective destinations. 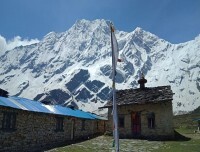 We had an amazing time on the Manaslu Circuit Trek. This was a challenging hike for us, but well worth it. We saw lots of animals, including monkeys, waterfalls and spectacular views . Bam was a wonderful guide. We learned so much from him about the area and Nepalese culture. We would definitely go with him again. 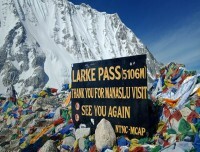 Highest elevation gain: At Larke-La 5,122 m high in between Manaslu and Manang areas.